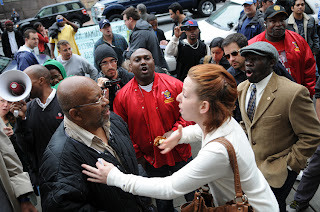 Fulton Foreclosure Auction Disrupted by Occupy Atlanta, JwJ and the CWA. Every month, hundreds of foreclosed homes are auctioned off on the steps of the Fulton County Courthouse steps. Yesterday morning, the auction was shut down by Occupy Atlanta, the Communication Workers of America (CWA) and Atlanta Jobs with Justice (JwJ). Auctioneers stand on the steps of the courthouse and read details about the foreclosed home including the name of the person(s) losing the home, the bank that is responsible for taking the home, the cost of the home among other information. In a few cases, the previous homeowner was in the crowd listening while her home was auctioned off. The most common banks trying to auction off foreclosed homes today were Chase, Wells Fargo and Bank of America. Today however was not business as usual for the banks and their home auction. As a gift to the city of Atlanta, the foreclosure auction was disrupted and a press conference hosted by Reverend Lowery declared the need for a national moratorium on foreclosures. 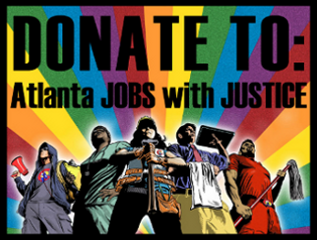 Atlanta Jobs with Justice has been working with Occupy Atlanta and Atlanta labor leaders to identify union members that are under the threat of foreclosure. The CWA came out in support of a retired member whose home was supposed to be auctioned off today. The labor movement in Atlanta is taking steps to lift up working families not only in the workplace, but in our communities. The war on workers takes place not only on the shop floor, but throughout our daily lives. We will fight back on all fronts. The number of foreclosed homes staggers the imagination and with more adjustable-rate loans about to reset, the end is nowhere in sight. I can't imagine how those people felt about their houses being auctioned off. It must be a very saddening experience. I hope that people who are currently in the battle of foreclosures will be able to find ways to prevent foreclosure crises from happening.